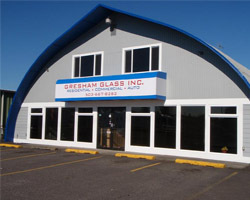 We’ve been a locally owned and operated glass business serving the Gresham and NE & SE Portland areas for over 37 years. We serve Gresham, Portland and all of East County from our shop located at 250 NE Hogan Drive in the heart of Gresham. We specialize in glass for both residential and commercial properties. Our company sells the highest quality products and we can assure a job well done in a timely manner. We perform work for many well- known businesses and restaurants, school districts and residences. We are licensed, bonded and insured in both Oregon and Washington. Please use the form to the right or call us at (503) 667-8282 for all your glass needs.